Tracking devices gradually become part of our life. The market is growing rapidly, and different manufacturers offer various solutions. The Flex is the first wristband tracker for tracking steps, sleep, and calories from a reputable manufacturer of fitness trackers - FitBit. The design is stylish in its simplicity. Made of matte plastic, it looks like a band on your wrist, very comfortable to wear. The only decoration is a plastic grey latch for poking in plastic teeth into holes of the band, a thin, dark plastic window, as well as an inscription “fitbit”. 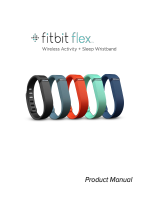 The Fitbit Flex comes with two adjustable wristbands: large and small. The length of the band is adjusted, and the method of attachment will be familiar to anyone who has ever worn a baseball cap. The bands are made in several colors: blue, green, orange, black and dark blue. The Fitbit Flex construction feels very sturdy and reliable. The wristband sits firmly and confidently on your hand, the fear of losing it or break does not occur at all. The Fitbit notes that the Flex is not afraid of sweat, rain and water immersion. You can use it in the shower and dive with it to a depth of 10 meters. Like all new FitBit trackers, the Flex connects to devices via Bluetooth. Currently it works with the iPhone4S and the iPhone5, Samsung Galaxy S3, Note II and above, as well as the iPad starting from the third generation. But the Fitbit promises to expand the list of supported devices. The package includes also a tiny USB-dongle for Bluetooth-connection to Mac and PC, but if you intend to use the Flex only with a mobile handheld device, you do not need the dongle at all. Bluetooth support allows you to use background synchronization. You will need to enable the appropriate option in the application menu, and then the data will be transmitted from the device to the application automatically without your participation. It is very convenient, because you do not have to remove the wristband from your hand for synchronization. In theory, it is needed only for the tracker charging. The Flex tracks the number of steps taken, the distance covered, and sleep. It also counts the number of calories burned and the period of "high activity" every day. All other FitBit products have small screens, which display the information about your progress. Here we have five LED-indicators that show your progress in a very interesting way. If you set your daily rate of activity, then tap twice on the wristband, you will see how much your progress is. Each LED light indicates a 20% progress. It is curious that the calories burned are calculated not only during the activity hours, but also when you rest. This indicator is based on your physical data: height, weight, age and gender. To convert the Flex into a sleeping mode, you should quickly tap it for a second or two. The wristband will vibrate and the LED-indicators will go off, notifying that the tracker is sleeping. You can wake it up exactly the same way, by frequent tapping. In the sleeping mode, the Flex calculates the duration and quality of your sleep: these data include how quickly you fall asleep, how often you wake up at night, how long you are in bed, and, in fact, in a state of sleeping. All this information about the activity and sleep is displayed in the Fitbit application and on the official website. The information display can be configured, so that you can see only the information you need. Like most wristband trackers, the Flex wakes you up by vibration. The alarm can be set in the application, and on the website, as well as to schedule your wake-up. Unfortunately, the Flex does not feature the function of "a smart alarm». For example, the Jawbone UP has such a possibility, when you set a temporary period for waking up, the device analyzes sleeping phases and wakes you up at the most favorable moment, at the stage of a shallow sleep. The Flex wakes you up at the exactly specified. The manufacturer claims that a full charge will last for five days of use, and the charge lasts about three hours. Light and comfortable, with a nice design and a good list of features the FitBit Flex can be recommended as one of the best fitness trackers in the market. The FitBit Flex in the form a wristband has a very good advantage: unlike those trackers, which you place in a pocket or attach to clothing, the wristband is not so easy to lose or casually put into a washing machine.